Hemp is just now – FINALLY allowed to be grown again in the USA. However there is not yet any access to American-grown commercial hemp for use in making hemp wicks. 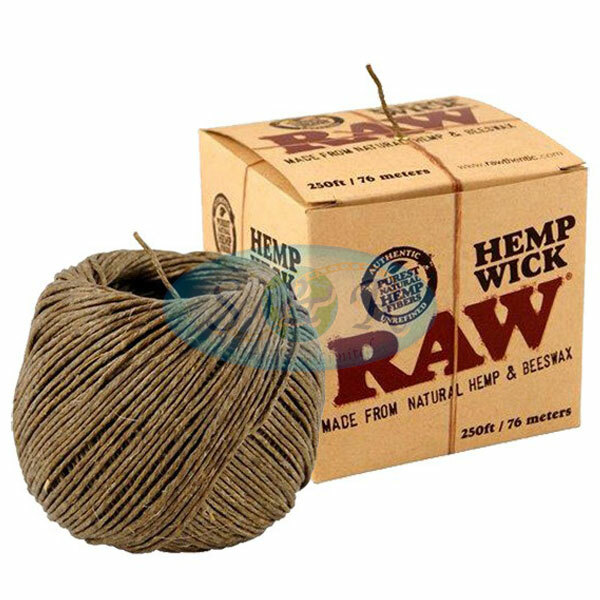 Therefore Raw had to make these hemp wicks in the #1 producer of hemp worldwide – China. The plants are sown, harvested, retted and dried in the traditional way, unchanged for thousands of years. Raw hope in the coming years to be able to switch to domestically grown hemp for their wicks and it is their commitment to be one of the first to do so In the meantime they insist that their hemp suppliers use sustainable growing techniques with no pesticides. RAW® Hemp Wick™ is a natural alternative to butane lighters and matches. Hemp and beeswax are two primal renewable resources. All RAW® Hemp Wick™ packs, display boxes and cards are printed on recycled and, or hemp paper.